Just one shot from the Raconteurs' concert tonight, during which Jack White and his accomplices brought the rock show to the Pageant. This is one snap of the man himself that I liked from the evening's set. Stay tuned for the full write-up and image gallery from the show – as always, complete with shooting notes. Thanks, glad to hear you like this one. The full set of images will be up soon! i totally dig their second album. Thanks, G. To be honest, I haven’t listened to the Raconteurs second album, but I will have to give it a spin. The band had some amazing energy during the concert, it was a true rock show. Great shot Todd. I love the Raconteurs! Thanks, Will! I hope I’ve done the band justice for you in the full set, which I’ll be posting next week. It was definitely a challenging shoot, since the band was about 4-feet back from the front of the stage and playing behind some huge speaker monitors. As they say, steady as she goes! Nice pic, bet it’s a damn fine concert! Thanks, Celso. Jack White and the rest of the Raconteurs put on a great show with tons of energy. After seeing the Raconteurs, now I’m curious to see what the White Stripes can do. Probably they could even better… A friend of mine went to a white stripes gig last year and he enjoyed every second of it… Guess they really are that good! 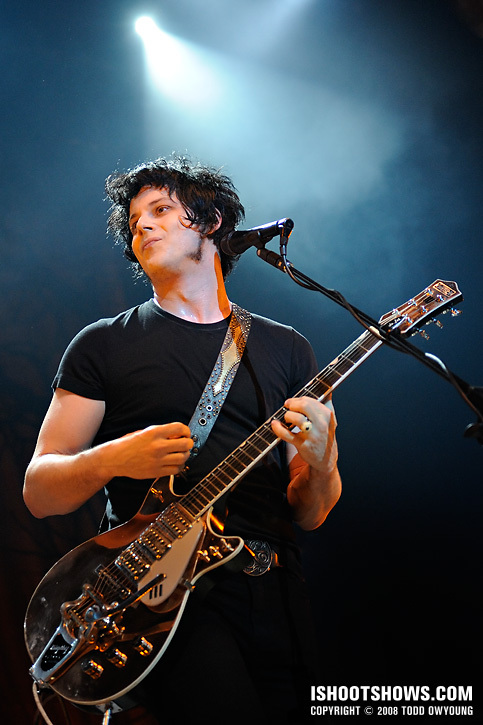 Their passes and security measures, in a sense, exemplifies how Jack White means business. It also makes for cute souvenir badges! Their 3 NYC shows were great, especially the 2nd night when Nick Zinner took the stage (and left somewhat shyly) for an encore song. I don’t know if you got any aerial perspectives during the gig, but his pedal board is among the most wicked set up I’ve seen– looks almost all copper. Looking forward to seeing the entire set! Thanks for the comment, nice to hear from you. I always keep my passes as souvenirs. Last time I saw him, Nick Zinner sort of looked like a skinny version of Jack White. That must have been a great residency. Great shot! I’m anxious for the rest and your review! Thanks, Lisa. Hope to post the rest of the images and the write-up soon. When I initially read this, I thought you only got one shot of him for some reason, haha. Had to make it count, right? Looks great! Can’t wait to see the set! Heard you saw Ryan today — he called me and he’s like, “So — guess who I just ran into…” Ironically, I was shooting a local show at the same time! He mentioned he told you about the 80-200 AF-S I’m getting — I’m excited (but completely bum broke — literally) — but I think it will serve me well. I got it for 2 reasons: 1) I need a telephoto for concerts [eventually, at least] and simply can’t get the 70-200 VR right now and 2) Going to Nicaragua in 6 days and wanted some tight shots of the monkeys I’ll be studying in the trees — which brings me to my next two points I was going to ask you about eventually — 1) Sorry, I’ll be gone a month in Nicaragua (haha), so I won’t be able to see/make comments as much as usual, or if at all (but you have a huge fan base, so no loss :P – plus there’s Keith!) and 2) Any ideas for protecting my equipment in a dry/semi-humid environment? Looking into the Crumpler 7 Mil. and some silica packs, but didn’t know if you had any other thoughts. Yeah, I saw Ryan when I got to SLU. He did tell me about the 80-200mm you are getting, which is great. They only made that AF-S version for a year or two before discontinuing it, but I heard it’s a great lens. It’s a completely different design than some of the other 80-200mm lenses Nikon has, I think, too. With the 1.5x crop, the 80-200mm should provide some nice reach. Have fun in Nicaragua! I think my posts are going to suffer without your comments; it might take both Ryan and Keith to fill your shoes in that regard. As for keeping your equipment protected on your trip, I think silica packs will help soak up the wet air. The Crumpler 7 Million Dollar Home is a really nice bag, but it’s not really what I would consider weather sealed, so that’s something to keep in mind. The outer material will shed light rain, but the main flap doesn’t really overhang the main compartment in such a way that it will seal out water. I really like the Kinesis products – while building a setup can be pricey, they’re great for trips like this where you’re probably going to be on the move. And, if you want to sacrifice your pride and go for ultimate function/comfort, the belt system is going to be a lot more comfortable while trekking through the jungle. Hope this helps! Let me know if you have any more questions, and if for some reason I’m not in touch with you before you go, have a great trip! Can’t wait to see the rest of your shots! Hey Meg! I should be posting the full set on Tuesday or Wednesday.